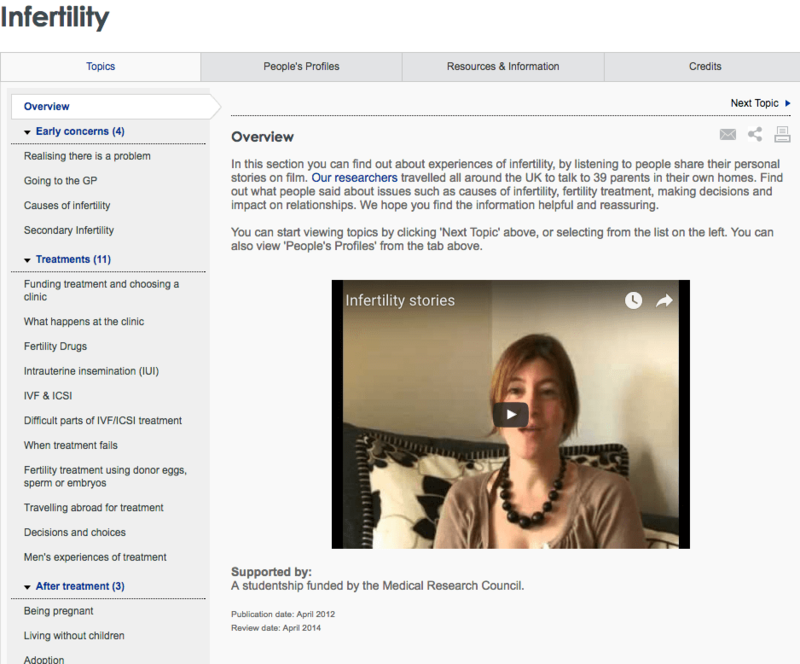 In the second of our guest blogs about fertility problems, Lisa Hinton, a Senior Qualitative Researcher in the Health Experiences Research Group (HERG) at the University of Oxford, talks about her research on experiences of infertility and collecting women’s and men’s stories for the www.healthtalk.org website. A few years ago, I had the privilege of interviewing 38 women and men around the UK about their experiences of infertility for the health experiences website, Healthtalk.org. I was repeatedly struck by their willingness to talk openly to me about a topic that was so private and painful, and something that they had often kept secret from their friends and even close family members for years. The site brings these concerns out into the open, and lifts a lid off women and men’s struggles to have a baby of their own. Whether or not to tell friends, family or work colleagues about their treatment was an often difficult and very personal decision. Many felt from the outset that it was private, “and not necessarily something you want to discuss with everybody”. The reasons people gave for not wanting to talk about their infertility and treatment varied. While some just wanted privacy, others were keen to protect their families from their disappointment or were concerned that friends would treat them differently and not want to tell them about their own pregnancies. But not sharing their infertility meant often women and men were isolated in their distress. While some had chosen to keep their treatment secret, others who had told family, friends or work colleagues could still feel isolated if they thought that no one could really understand what they were going through. Catherine said, “I think you have to accept that people don’t really understand what you are going through, and people do sometimes say things that seem to you so crass and awful. But it’s just that they don’t understand”. How they coped varied greatly and people found support from a variety of sources. Most often their strongest support came from their partners and family. Couples often went through infertility together as a tight knit unit and parents and siblings were often very supportive, offering a shoulder to cry on, encouragement, and showing an ongoing interest in their treatment. Being able to access other people’s experiences of infertility and treatment, by whatever route (online support groups, face to face groups, colleagues), was often very valuable. Fiona wished she had known more earlier on about the emotional rigors of treatment. Mike was grateful to have been able to chat to colleagues who had been through treatment. Some spoke very highly of their counselling and recommended it for others going through infertility. Others described negative or unsatisfactory experiences or a mixture of good and bad experiences. Clinics do not all offer the same approach to counselling – it is sometimes standard, or as Sally described hers, “pretty much mandatory”, while elsewhere it is offered as an extra that needs to be paid for. Some wanted counselling but had difficulty finding anyone suitable in their area or on a day or time that suited them, or coincided with their greatest need (for example just after a cycle had failed). Joanna saw a general counsellor and wondered whether seeing someone with a specialist interest in fertility would have been better. Several participants spoke very positively about their counselling. Naomi said that it offered her a “license to air my feelings” and Fiona that it allowed her to “let off steam”. In addition to helping offload anxieties and worries, counselling could help people deal with their sense of isolation from friends and family. It could also help with the grieving that some felt they needed to go through. Couples do not always respond to infertility in similar ways and counselling sometimes helped people avoid consequent difficulties in their relationship. Michelle and her husband were encouraged by their counsellor to write their feelings down which they found very helpful, although she did rather dread the appointment. Clare and her husband responded to their infertility very differently; she felt lucky to have found a counsellor who helped them understand each other and deal with issues as a couple. The timing of counselling was important. There were times when it felt appropriate or helpful and others when it was not. Christine found the counselling she embarked on after a series of miscarriages and the death of her father very helpful. Sarah was helped by her cognitive behavioural therapy (CBT) after stopping treatment and before starting adoption proceedings. Going through infertility is a very individual and private experience, with unpredictable outcomes. What we’ve tried to do on the site is to cover as wide a range of experiences as possible. There are experiences from people who are still going treatment, as well as experiences from people who have had successful treatment and now have their own baby, and from people for whom treatment did not work. The www.healthtalk.org infertility site comprises 28 topic summaries on areas such as ‘realising there is a problem’ ‘going to the GP’, and the lived experiences of different treatments. There are also several summaries on the emotional and social impact of infertility; ‘to tell or not to tell’, ‘relationships with family and friends’, ‘counselling’ ‘men and coping’ and the ‘impact on relationships’. These topic summaries are illustrated by over 250 video, audio and written clips of women’s and men’s experiences which bring the lived and often secret experiences of infertility out into the open. Talking about infertility by Lisa Hinton is licensed under a Creative Commons Attribution-NoDerivatives 4.0 International License. Based on a work at http://www.healthtalk.org/peoples-experiences/womens-health/infertility. Images have been purchased from istock.com for Evidently Cochrane and may not be reproduced . Verkuijlen J, Verhaak C, Nelen WLDM, Wilkinson J, Farquhar C. Psychological and educational interventions for subfertile men and women. Cochrane Database of Systematic Reviews 2016, Issue 3. Art. No. : CD011034. DOI: 10.1002/14651858.CD011034.pub2. Lisa Hinton is a Senior Qualitative Researcher with the Health Experiences Research Group, in the Nuffield Department of Primary Care Health Sciences, Oxford University. She specialises in women's health issues, in particular around pregnancy and childbirth. Lisa has no other conflicts of interest to declare.